I had a bit of an off day today. No particular cause for it. It was just the way I woke up, and I couldn’t shake the feeling all day long. It must have been the cloudy sky. After so many consecutive days of glowing sunshine, a grey sky hanging much too low overhead can have that effect – at least on me. Wednesdays are my long days; I usually co-lead a seminar on Academic Writing in the morning (which I am likely to tell you about in future posts! ), spend the rest of the day at my desk working towards my PhD, and then I attend a course in the evening, from 5.30 to 8.30 — roughly the time when most others are crowding the metro and rushing home, making supper, unwinding after their day. The course is a bit outside of my comfort zone, too. My research interests are in the area of neurolinguistics (a combination of “language” and the “brain“) and specifically about bilingualism. How do children and adults learn a second (or third, fourth) language? How are different aspects of a bilingual’s languages stored and accessed in the brain? How does a bilingual’s mother tongue affect the learning of other languages? These are some of the questions that fascinate me. Because I love to learn, I have decided to take some courses outside of the core requirements of my PhD program and, sometimes, outside of my department. The course I am taking this term is in the Faculty of Education, and it is all about teaching a second language. So, here I am learning about the same topics, but from a totally different perspective — the teacher’s perspective, and sometimes the student’s perspective, but not so much from neither the neuro nor the linguistic perspective. It is an extremely interesting experience and I am learning a lot. But it also throws me off a little to be in a room with about thirty other students who have all had teaching experience and who all have tons of insight and intuition about bilingualism from a practical, educational point of view. So, as much as I enjoy my class on Wednesday evenings, it’s not so easy to shift disciplines, to be flexible, and to try and relate what I am hearing to what I already know. When my class ended, I stepped out of the Education building, eager to get home, to have something comforting to eat and a hot cup of tea, and to welcome the end of this somewhat tiring, melancholic-for-no-reason day. I stepped onto McTavish (above Doctor Penfield) and stopped in my tracks. My face softened into an immediate smile. Montreal’s skyline is quite breathtaking from there, especially by night, with all the city lights brightly puncturing the black backdrop like good old Lite-Bright. But tonight it was extraordinarily magical. Dozens of beams of light were shooting from the ground up to the sky, criss-crossing each other and erratically yet harmoniously dancing about. They had a blue hue to them, and seemed to be coming from near Place-des-Arts. 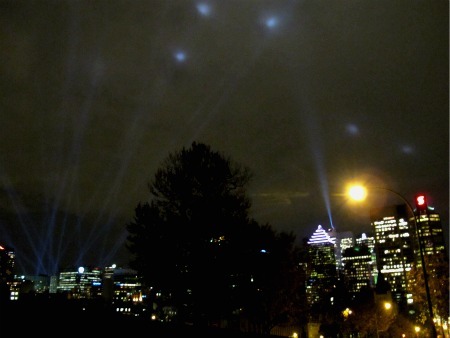 I glanced up at the Ville-Marie tower; its usual beam of light was whooshing over the city, steadily, regularly, in complete contrast to these other strange beams that did not belong to the typical Montreal-by-night landscape. I stood there for a good three minutes, watching the sky. I forgot about my day. I forgot about my class. I forgot about my urge to run home and call it a night. I watched this celestial display, in wonder, like a six year-old would. I walked down the hill, through campus and to the metro, smiling at the thought of how Montreal never ceases to amaze me with one festival or another, one artistic display or another. Last time I had this giddy feeling was when they had the musical swings at Place-des-Arts — literally swings that played music in different keys as you swung. I had discovered them on a rainy evening but that had not prevented me from spending a half-hour swinging carefreely in the rain, making music, in the center of the metropolis. 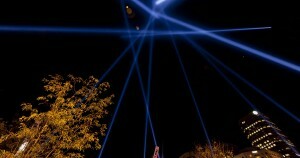 I came home and read about the dancing beams online. They will be on display until November 6th at the Quartier des Spectacles. Experiencing it directly is something I definitely want to do in the next days; apparently, we can control the beams from the ground, and watch as they interact with other participants’ beams in the sky. But seeing these beams from afar, in all their simplicity, as they illuminated the sky tonight, was all I needed to cheer me up. They literally lit up my day. Thank you for your wonderful note! I’m happy you felt the same amazement with the lights after a long day of work. It’s even more impressive when you’re in the middle of it at the Quartier des Spectacles (I went last night). Thanks for reading the blog!! Hi Kristina, it was the picture in this post which caught my eye and I immediately recognized the lights. I read your post and realized that I went thorough the same emotions a couple of days back, just like you did. After a long day of work, school and some more work, I was walking down the McTavish street when I looked up and saw the “Dancing lights”. I stopped dead in my tracks and continued to stare at the sky for a full 5 minutes before falling in love with Montreal all over again. Quartier des Spectacles, here I come. P.S – Also read your to do list. Good one. You have a new fan for your blogs. Bonjour! I would just like to offer my thanks for the awesome info you have here on this post. I will be coming back to your blog for more cool info soon.